Nearly All the MJ Merchandise Is "Bootlegged"
Jackson’s fans are mourning his passing and remembering his career by listening to his music and watching video of his performances. But they don’t yet seem to be buying Jackson paraphernalia. Tickets to the Michael Jackson memorial tribute were in heavy demand, with over 1.6 million requests for only 8,750 recipients, each of whom were entitled to a pair. 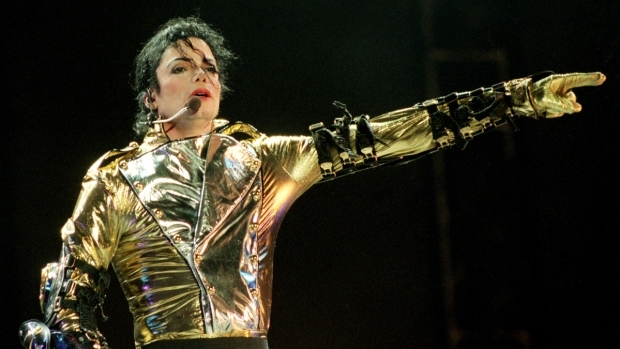 Michael Jackson’s music continues to surge. According to Nielsen SoundScan, his solo album sales in the U.S. alone went from 10,000 in the week before his death to 422,000 in the week ending June 28. Sales of Michael Jackson merchandise? Not so hot. “There hasn’t been a demand in recent years,” said Marty Brochstein, senior vice president for industry relations and information at the Licensing Industry Merchandisers’ Association. Jackson’s fans are mourning his passing and remembering his career by listening to his music and watching video of his performances. But they don’t yet seem to be buying Jackson paraphernalia — T-shirts, hats, coffee mugs, mouse pads and the like — in significant numbers. And that may be partly because licensed material has been unavailable. As Brochstein pointed out, the demand for licensing of Michael Jackson items just wasn’t there before he died at age 50 on June 25 at his Los Angeles residence. It was only on Monday that a Superior Court judge in Los Angeles ruled that attorney John Branca and music executive John McClain should take over Jackson’s estate for now. That means besides the memorial service, funeral, investigation into his death and custody of the pop star’s children, the Jackson estate will also have to deal with licensing of Jackson’s name and likeness for merchandising. Until that is sorted out, vendors on the street and in many stores will be selling wares made from “independent” sources that are not licensed. “There are ways around it,” explained Alex Tchekmeian, president of AKT Enterprises, a network of businesses that handles entertainment-related goods and services, but is not currently in the Michael Jackson business. “You can’t use his name. You can’t use specific things that correlate to what he’s done. In Los Angeles, the area around Staples Center, site of Tuesday’s memorial service, is in virtual lockdown save for law enforcement personnel and those ticket holders. In another part of town, David Pohar, owner of New Way Silk Screen Printing, is filling orders for T-shirts from entrepreneurs looking to capitalize on the sudden interest in Jackson, to be sold on the streets near the Staples Center perimeter. Pohar worked for a different company when “Thriller” came out in 1982, he said, and that resulted in the sales of “a couple hundred thousand” replicas of white sequined gloves. Ira Mayer, who runs a trade publication called The Licensing Letter, said Jackson damaged his brand in recent years and as a result eliminated the market for merchandise and memorabilia. “He used to be able to sell gloves and shirts and other merchandise,” Mayer said. “But once you had him dangling the baby off the terrace and the charges of pedophilia, who wants to go there? Wal-Mart certainly doesn’t want to go there. Indeed, a quick perusal of Michael Jackson stuff on eBay shows few if any bids for most items, although there are some, like an 11-inch MJ doll that received eight bids ($52 top bid) or a “King of Pop” T-shirt that attracted 11 ($15 top bid). “The music side of things is completely blowing me away in terms of how many CDs that are being sold,” Tchekmeian said. “People will buy DVDs to remember how great he was. There is much lower demand for T-shirts and other things. There is a time element involved, but opinions vary as to how long that will be. By the time the Jackson estate gets its licensing ducks in a row, will the interest in souvenirs evaporate? And will bootlegs fill much of the demand in the interim?